A purchase order is a form that represents the list of large quantities of raw goods or supplies from a vendor on a regular basis. It is an offer on paper made by the buyer to the vendor to buy a specific product, in a specific amount, for a specific price. Once a vendor accepts this purchase order, it becomes a contract between the buyer and the seller. Now it becomes the duty of the vendor to send the goods enlisted in the PO, and also send an invoice along with it. A purchase order form can be used either for products or services. A purchase order often abbreviated as PO is an official document issued by a buyer to a seller for explaining the facts of purchase in a detailed manner. A simple purchase order serves as a legal record which accounts the milestones of the transaction in a formal way. A general purchase order template precisely streamlines the stock of store and assists the business to track the orders carefully and provide goods to the buyer in the first occurrence. Does your company really need purchase order management software to manage purchase orders effectively? A purchase order is a legal sales contract document that buyer uses to order services or products with agreed price from a vendor or seller. Purchase orders help both buyers and sellers in purchasing and order processing. Purchase order allows buyers to communicate clearly with the sellers about products or services being ordered. It also helps protect buyers in case buyers refuse to pay for products or services. What is a Purchase-order Template? Creating an effective Purchase Order is a difficult job because it includes a lot of calculations, combinations, additions, the detailed mentioning of business tasks as per their occurrence along with the financial data. The templates that are readily available are the best for the purpose of recording of financial and business data in MS Excel tool as spreadsheets. Each of the templates available over the web offers a feature unique designing and data calculation process to generate purchase orders with great detailing and perfection. The basic purpose of these purchase order templates is to help users deal with the calculation and quantity part quickly and accurately. Business Purchase Order Template – It is an offer on paper, to buy a specific product, in a specific amount, for a specific price. It includes the materials needed for production for manufacturing industries or retail products for merchandising businesses. Construction Purchase Order Template – Purchases related to construction projects are issued with this type of purchase order template together with related work order templates for the workers involved in the construction. Jewelry Purchase Order Template – Purchasing jewelry from a jeweler entails the buyer to secure this type of purchase template in order to have formality on the purchase. It is also the document which serves as the security of your money and entitles the firm from where you brought it. Local Purchase Order Template – Local purchases of buyers from local suppliers are processed starting with the issuance of this type of purchase order template. Export purchases of the company have different requirements outside the scope of this template. Car Purchase Order Template – Buying a vehicle from a car dealer needs the procurement of this purchase order template. It also deals with the car accessories in the same way between the car dealer and the buyer. 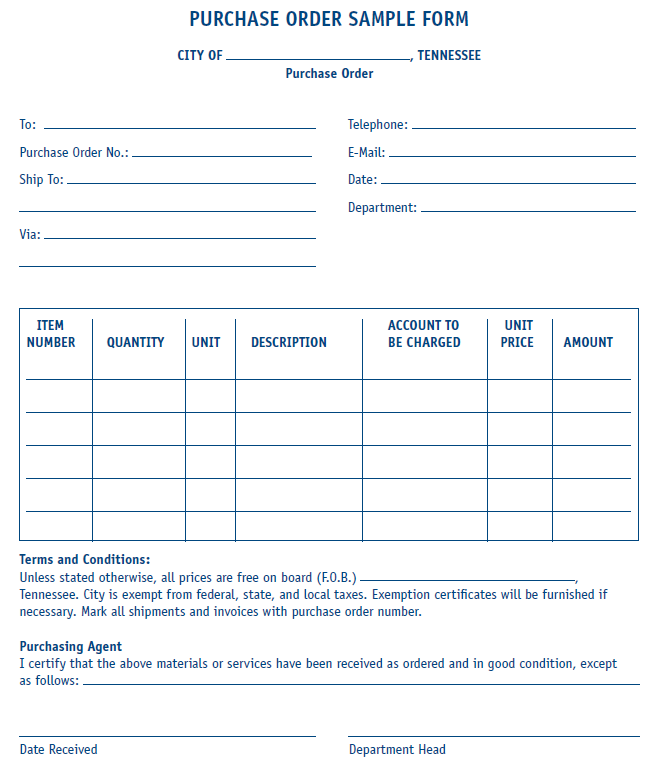 School Purchase Order Template – School supplies and equipment to be used by the academic institution is bought with the procurement of this type of purchase order template first before the delivery of the items. Standard(PO)– Typically used for one-time purchases, the Standard PO is the most common type of purchase order.On your requisition, you will select RQ Standard Requisition and once the Purchasing Department converts your requisition to a purchase order, the type will change to PO Standard Purchase Order. Blanket(BO)– used for items that cannot be quantified and remain open for a given period of time.Example: Your office uses a paper shredding company to conduct monthly office visits to shred paper; a blanket PO is used to cover the costs for an entire fiscal year (July 1 to June 30). When the vendor invoice arrives periodically, you’ll complete a routing slip and send both to accounts payable for payment. Library Blanket(LB)– It is used for library orders of books, references, and periodicals for office, college or school end use. Service Contract(SC)– This is used for maintenance services, consultants, and warranty services, typically accompanied by a fully executed contract or another instrument. Prepaid(PP)– The Prepaid PO is used for the orders that require payment in advance. It is often a mutual understanding between the buyer and the vendor. Example: Registration fee that needs to be paid prior to a conference. Emergency(ER)– The Emergency PO is used for orders that require immediate attention to protect the welfare of students, staff, and property of the College. College Stores(CS)– This is mainly used to order supplies from the College storeroom for the internal college use.It includes copy paper, envelopes and various forms. Office Supplies(OS)–It is used for creating an online order of the office supplies. This type of PO is required before an online order can be placed. Businesses nowadays have started to rely on purchase order financing to help them buy larger quantities of goods and supplies without harming their cash flow as many vendors give them time to recoup the money which has been spent while working to grow the business. 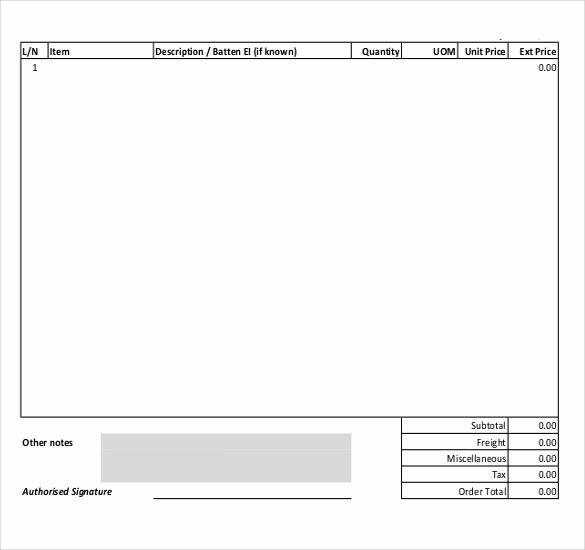 A purchase order template is only used in the business-to-business marketplace, unlike an order form template. Retailers, construction firms, ad agencies and other vendors typically accept purchase orders from companies they believe are credit-worthy, after all, it is the matter of money, this means that they consider a good customer who pays on time in return of in time goods delivery. A purchase order is set up to keep the same cash flow until the invoice is due as this is a vital function that helps grow the business. Many companies mainly make use of the Purchase Order forms so that they can order goods on credit. Remember only once the vendor accepts the purchase order it is considered as a legal contract that you are guaranteeing payment for. For example, a retailer who expects a particularly busy Xmas season may place an extra-large order to keep up with the anticipated demand. If the retailer uses only his cash flow for this purpose, he would only be able to order a limited supply of goods and would risk missing out on profits before the shopping season ends. A purchase order is a commercial document which is generated for indicating the stuff related to the purchase. A Purchase Order Templates helps you control your purchase by giving a clear and concise report of every activity. Here are some pre-designed Purchase Order Templates which will help you to efficiently enter data for financial analysis. Excel Purchase Order Template: This is ideal for small business as it allows maintaining accounting, financial, and sales data in a spreadsheet with MS Word, PDF, and HTML documents. Also, it has provisions for doing online break-even and productivity analysis. 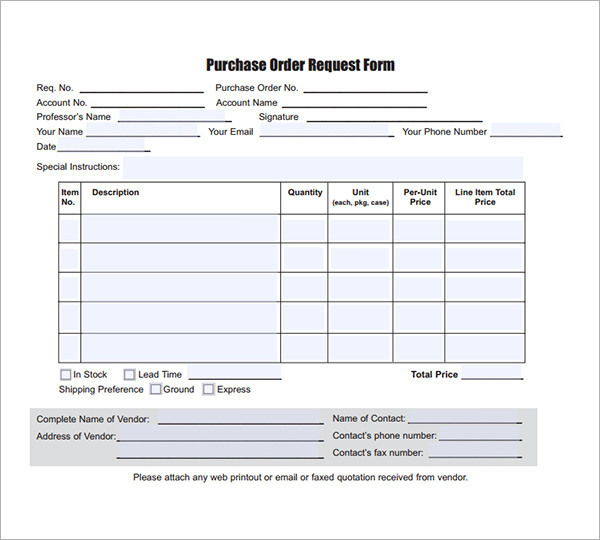 Simple Purchase Order Request Form Template: It includes all the information needed to place a purchase order like description, stock, quantity, unit price, total cost involved along with requirements of quotes and fund approval. 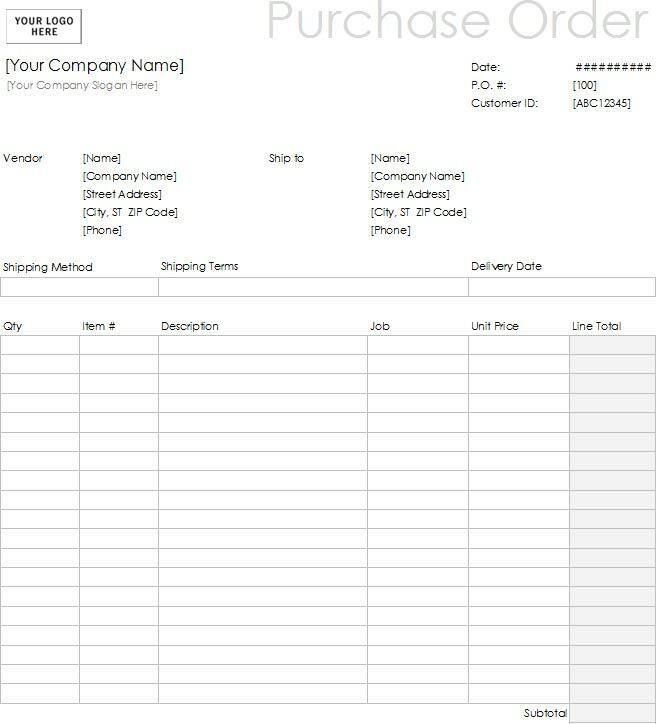 Blank Purchase Order Template: This template helps you get a great comprehensive agreement for project works covering the scope of work, details of items to be purchased, price, delivery schedule, terms & conditions, confidentiality requirements, legal requirements, and safety measures. 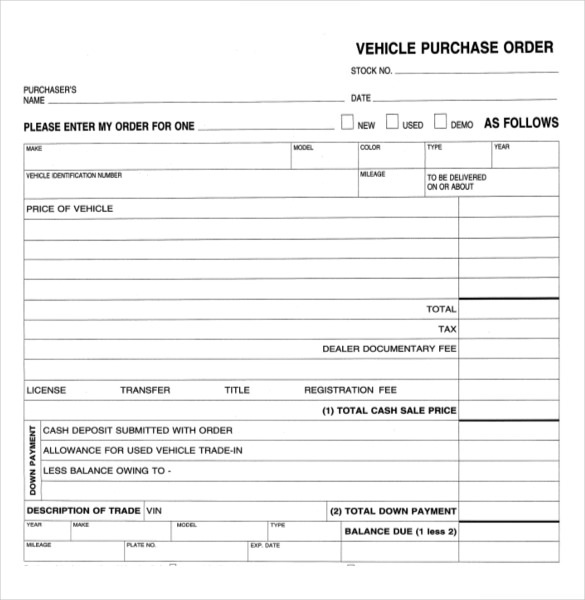 Vehicle Purchase Order Form Template: This purchase order template requires a long list of details other than vendor details. It includes detailed data about the vehicle like its category, description, vehicle base price, vehicle options, total price, and terms and conditions, etc. 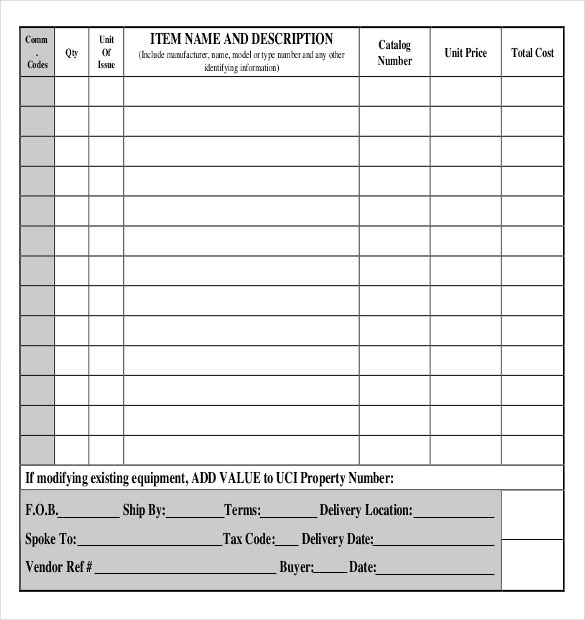 Simple Blanket Purchase Order Template: This template includes the purpose, scope, background, and procedure for issuing a blanket order for the repetitive purchase of materials or services. Using this you can save a lot of time and paper works. 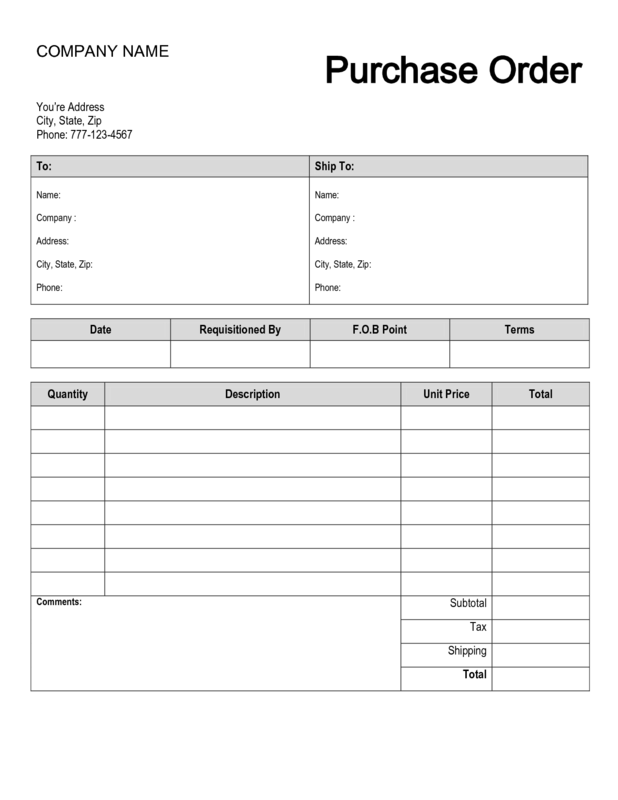 Retail Purchase Order Form Template: Sample is a ready made form where you only need to fill up the boxes details of the customer – name, address, customer ID, delivery address, email etc. It comes with sections for the pattern, quantity, fabric name, price per yard and the total amount paid. It has options to fill credit card information, and how they found out of your organization. 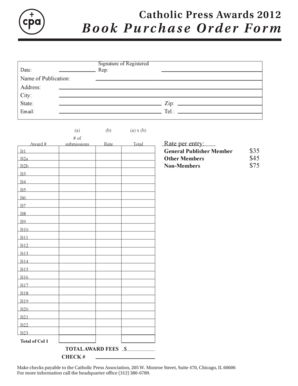 Internal Purchase Order Template: Like the Standard PO, it usually includes the details of the vendor, shipping address, purchase order number, date issued etc. along with the description of the items purchased, quantity and cost of each item, extra cost. This template provides the systematic processing of purchase and also provides the facility to add notes in the special notes column which is available at the bottom of the template. The following are standard elements of a comprehensive purchase order. Unique purchase order number for accounting and inventory usage of the buyer. The contact information of both buyer and seller. Date on which the purchase order was submitted. Payment terms – agreeable by both the parties. Shipping address, carrier preferences, and additional details as per the mutual terms. Details of items ordered including quantity, item number, description, unit price, and total cost. Shipping, tax, and other freight fees. Signature line for approving representative of the company. Date seller must notify buyer by if there are any problems fulfilling the order. Logo: you can add your own company logo to make it appealing to your vendors so they can quickly realize who is ordering products or services. Company details: includes company name and address listed at the top of the purchase order. You can fill out your logo and company details first to make a new purchase order template for your company. P.O. #: P.O. number or purchase order number helps you to track the purchasing record. When the vendor issues a sales order, the corresponding purchase order number is also used to fill out in the sales order. Vendor details contain the name and address of the vendor that you are buying their products or services. Ship To: the address that you want to order products to be shipped or services to be rendered. Ship method: shipping method indicates how you want products shipped. Shipping terms: You can enter shipping terms such as FOB (free on board), CFR (cost and freight)…. Delivery date: is your expected delivery date that you want the vendor to deliver products or services. Authorized purchasing person’s signature: each purchase order needs a signature of authorized purchasing person who is in charge of ordering products or services. Note: if you want to send more information to the vendor, you can add it into the note section. Browse and download the template you need as per your requirement. Check the preview picture of each purchase order so you know how the template looks like before you download it. Insert company’s logo and details to create your own purchase order template so as to match it with your other documents. Adjust the fonts, colors, and format for documents, as per your company’s standard fonts and color. Using purchase order templates is a cost-effective solution to your purchase order management challenge as you need not waste your time to learn and pay for expensive and complicated purchase order software or purchase order management systems. All you need is Microsoft Office.